In the late 1990s, shortly after arriving in the United States, it became clear to Dza Kilung Rinpoche that his Western students responded to traditional meditation instructions differently from his students back in Asia. The Westerners didn’t know how to relax — our pressured, fast-paced lifestyles carried over into meditation. The Relaxed Mind contains instructions for the seven-phase meditation practice Dza Kilung Rinpoche developed for students in the West. It’s very traditional, yet adapted to counteract the overwhelming distraction that is becoming a global culture these days, not only in the West. Experienced meditators may be surprised to find their practice deepening through letting go of tension. 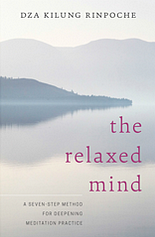 This is also an excellent meditation manual for any beginner.